Have you ever seen the film, The Double Life of Veronique? It’s by Polish director, Krzysztof Kieslowski, who’s probably best known for his amazing trilogy, Three Colors: Red, White, and Blue. Veronique tells a fantastical story of two women: Veronique, who lives in Paris, and Weronika, who lives in Poland. Physically identical, the two women live parallel lives but haven’t met. It’s a great film that uses magical realism in a way that pushes an uncanny story through a sieve of supernatural believability. Supernatural believability? Wha? I have a friend whose name sounds like Maria. We are close in age and live in parallel cities. 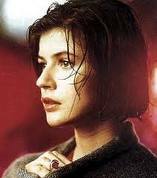 We aren’t identical, but if you fused our features, we’d look a little like Irene Jacob above (mostly because of Maria’s Eastern European beauty). Dennis and I walked into my gynecologist’s (let’s call him “The Prince”) office on November 17, 2008. We left in tears over the news that I had a late-stage version of ovarian cancer and needed surgery and chemo asap. Four days later, Maria and her husband walked into the same office. The Prince gave them the same news. On November 24th, a cracker-jack surgeon from UCSF and The Prince spent five hours removing the cancer and many parts from my body. Two days later, the same two doctors did the same for Maria. She was put in the hospital room two doors down from mine. I remember walking past her room with Dennis and his brother Mike when I was just barely ambulatory. I heard Maria’s husband talking in a hushed tone on the phone while Maria slept. “It is at least stage III,” he said in a Russian accent. “They said they usually never catch it earlier than that.” I knew what he was talking about. Two weeks later, I went to see The Prince. I told him that malignant fluid had moved into my lungs and that my cancer was now Stage IV. But I wasn’t worried. The chemo was going to work. I knew even then. He gasped in amazement. The Prince said the exact same thing had just happened to Maria. Fluid had gone into her lungs, too. Six months later, I finished my treatment, and as many of you know, enjoyed a year-long remission, cancer free. In May of 2010, I was back at the Cancer Center, getting chemo for my recurrence, through my fancy port. The woman next to me was looking at me like she knew me. “Are you Jennifer?” she asked. “Are you Maria?” I answered. Her cancer had returned around the same time mine had. We both responded very well to the chemo, a combination of Gemzar and platinum, our disease retreating as quickly as it came. We are both feeling stronger day by day in our second remission. And we are both starting another parallel journey together, a vaccine maintenance trial at UCSF. Here’s how the trial will work. Fifty percent of all patients will get a general immune-stimulating agent made from some kind of Chilean tree bark. Fifty percent of patients will get the bark agent plus a vaccine designed to keep ovarian cancer from returning. “I had to take my cat to the vet,” Maria said to me recently. wow. this must mean that she too is an elegant writer, smart as can be, laugh out loud funny, and was a ted nugent fan at age 10. Wow Jenn, what an amazing story. We really can find our kindred spirits in the least likely of places! WOW, wow, wow!!! speechless except for that….